Peeks Around 14 is the Buddha Altar. There are some photos of Shawn and me and of the original triumvirate, Nelli, Tiki and Mr. There are some awesome candles, the one in the center is the Buddha candle from 13 Magickal Moons. The other two are blood orange from Pacifica. Another candle to the right is Sacred Space from Lemurian Spirit. There's a dish with the sage and some stones and rocks. Buddha is holding a crystal and there is a rose quartz and a shiva lingam. And Ganesha is sitting on Buddha's right knee. 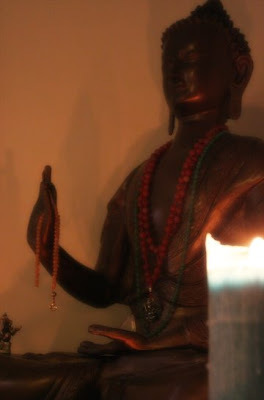 I also keep my malas on Buddha. 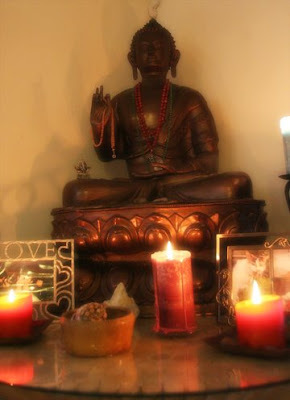 This altar adds such an amazing peacefulness and calm to the entire house. You can definitely feel the energy and it sits just inside the front entrance to our home.